Coexisting With Nonhuman Animals: Episode 4 Changing Stereotypes: World Vegan Day! Episode 4 Changing Perceptions: World Vegan Day! Welcome to another episode of Coexisting With Nonhuman Animals. Happy World Vegan Day to everyone listening! The first of November each year is World Vegan Day, I think its a great idea. I'm celebrating by wearing my Team Vegan shirt. Team Vegan is a great New Zealand group, for Vegans who enter into sports events. You can find out more at http://www.teamvegan.net.nz/ . I think World Vegan Day is a really great idea, if it serves to promote veganism as a good way of life. I'm tired of the Vegan stereotypes that many people have, hopefully as we celebrate World Vegan Day, we can show the world that Vegans are not monks who spend every waking hour in a state of meditation, but that we are regular, fun people. I'm going to play some favourite "Vegans in the popular media" clips. I would like to point out, I dont think the average New Zealander would know what a Vegan is, Vegetarian yes, but not Vegan. Veganism seems to be far more popular overseas, right now at least, than here in New Zealand. The point of these clips is to point out how Vegans are reffered to in the mainstream media, after each clip, I hope to point out things that are wrong, or ways we can change how we are portrayed..
My first clip is of Glen Beck, an American Right Wing host, on Fox. This is perhaps the worst kind of Vegetarian, or Vegan bashing, to make out that Vegans are unrealistic snobs who think they are better than everyone else. To throw a bunch of jokes at a bunch of Straw Vegans like Beck did, its really annoying for me. I get that he likes to eat steak, but no vegan I know has tried to make meat illegal! We dont agree with animal products, yes, but I certainly dont go about killing people who eat steak! I dont know of anyone trying to force a law that sees people who eat meat being put on death row for murder! The idea of radical extreme vegans really needs to be changed. I blame a lot of PETA campaigns for this image, that we all picket and protest, that we throw fake blood at people wearing fur coats, that we put women in cages etc. I'm a very reasonable person, who just happens to be vegan. Im not reasonable because or despite being Vegan. Being Vegan is one part of who I am, Im not a 2D cartoon character, and I really get annoyed when Vegans are portrayed as such. Something else from Beck, the idea that Vegans have to suffer through awful food. Beck brings up Al Gore eating animal products. He mentions Al Gore would have to give up things he loves. Chocolate, as we all know, is most definitely vegan. When Beck mentions having to replace it with some "bean thing", yeah, has he even a clue how chocolate is made? From Cocoa BEANS! I like pointing out that most every substance people get addicted to is vegan. All hard drugs seem to come from plant sources, alcohol comes from plant sources, sugar is from plant sources, coffee comes from beans, chocolate comes from beans. I dont drink alcohol, but its not because I'm vegan, and am suddenly not allowed it, I just choose not to. The only time that chocolate wouldnt be vegan, were if it had been "watered down" with cows milk. The real thing is most definitely vegan. I was a little worried when I first were vegan, because Cadburys chocolate included milk. I wasnt sure if I would be able to keep having chocolate. But, a very well known, in New Zealand, company, Whittakers has a lot of different Chocolate that doesnt include milk, and its the same price as any other mainstream chocolate. Its not like it has to be specially ordered, Whittakers chocolate, that happens to be vegan, can be found anywhere in New Zealand. Climate Change is a real thing, of course the planet is changing all the time, and Im sure that many things we do have an effect on the climate. If we can can change the course of rivers, why wouldnt we be able to screw up how hot or cold the planet was as well? Even if you believe in a supreme being who keeps the world balanced, I think its foolish to deliberately wreck the planet. Its the only one we have. But, Im not vegan because of concern for the environment, Im vegan because I care about animals, its an ethical choice I've made, just one of the many compelling reasons to be vegan. My second main clip is more lighthearted. Its from Grand Theft Auto 3, I have the game audio from all GTA games, I love listening to the fake radio stations while I work. The main clip features a Vegan martial artist. I'd love to have included more GTA clips about vegans, but many are really too upsetting to play here. Those was more of the generic Vegan jabs, that we are all deathly thin, pale, and weak. That we practice some crazy diet, that we suffer just to feel better than everyone else. Again, nothing resembling the truth. How do we go about changing how we are seen? By events like World Vegan Day of course! Lets be proud of being Vegan, lets show that we are nice people, no different to anyone else. I dont really want to be in some sort of "Vegan Pride Parade", going down the mainstreet of my rural city, but occasionally I wear a Vegan shirt, and I talk about Veganism with anyone who asks me what a Vegan is. I think we do the Animal Rights movement a big favor by being reasonable, by being clear in what we believe and want, and being non-threatening. I've asked some friends to appear on my podcast. First, Sam Tucker sent a clip. My second clip is from Elizabeth Collins, of NZ Vegan Podcast. I think its really important that Vegans use creative education to spread the word of Veganism. 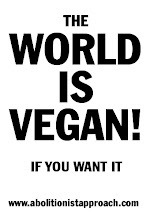 World Vegan Day is a great example, its not difficult for vegans to wear a Vegan t shirt on the 1st of November. It doesnt really cost anything, I know of creative Vegans who nicely painted slogans onto regular t shirts. That costs essentially nothing to do, paint, or a pen costs very little, and has an impact as people see you wearing your newly made Vegan shirt. After my outro, I'd like to play audio from a video I recently saw online. Its called "Just Different", and can be found on YouTube. I'll include a link in my shownotes, which can be seen in the Lyrics section as you play back this episode, or on my blog, coexisting with nonhuman animals .blogspot.com. Lets all be proud of being Vegan, today, the 1st of November, is OUR special day. As an Atheist Vegan, its personally more important to me than Christmas! Lets do all we can to spread the practise of Veganism, creatively. Happy World Vegan Day! I agree that we need to make veganism more mainstream... After all, we are all just "ordinary" people who have chosen a thoughtful lifestyle. One that we all were taught to live by to begin with! How much more "normal" can you be? The clip at the end from "Just Different" is beautiful with or without the visuals. I took the liberty to tell Brandon at Screaming Chicken Animal Rights Activism about your podcast, and the mention of his video. Like Sam Tucker, he's just a young teen too. Gives us hope with the very youthful are so articulate and positive in their activism.